The pre-production coin shown above played a part in the production process of the POTF Barada coin. This stage of the production process is referred to as a softcopy or "rubber". A coin begins its life as a plaster sculpting. The image on the original sculpting is a positive one, meaning it exhibits relief. From the sculpting a negative image hardcopy stage is cast. Collectors refer to this as a "stage 1" hardcopy to differentiate it from the similar, but later, tooling master. The coin softcopy is created using the negative image stage 1 hardcopy, so the image on the coin is once again returned to a positive images as a result. The softcopy is a key stage as it represents the piece from which the final tooling master (stage 2 coin hardcopy) is derived. An exhuastingly comprehensive account of the entire coin production process is located within the Archive's A Coin is Born special feature. Nearly all of the hardcopies and softcopies featured on the Archive are the results of two very significant prototype finds. The first, made in 1997 by Chris Fawcett, yielded the first softcopies known to the collecting community. Although collectors were for some time confused about their role in the coin production process, things were cleared up substantially in 1999, when a collector unearthed another stash of pre-tooling coin prototypes. Included in the find were over 100 pieces. Some were softcopies just like those turned up by Fawcett, but the bulk of the find consisted of negative coin hardcopies. Virtually all of these items--both hardcopies and softcopies-- are one-of-a-kind pieces. Fortunately, along with these fabulous prototypes came considerable information regarding how the coins were made, including details that made the softcopies' purpose apparent for the first time. A third, smaller softcopy find by The Earth, consisting of ten coin softcopies amongst additional 3 3/4"figure and Micro Collection prototypes, surfaced in 2004. 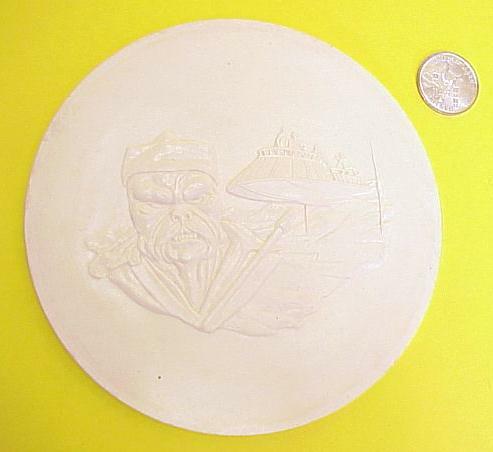 This Barada coin softcopy was part of the find by The Earth Collectible Toy Mall. The Archive features the most comprehensive assemblage of coin pre-production images found anywhere. Collectors will be happy to know that the matching plaster sculpting and stage 1 hardcopy for Barada still exist, and may be viewed on the Archive.